All of our stickers are made from only the absolute best material and printed with outdoor durable eco-sol inks which are friendly to the environment and will last for years. Stickers will come with an overlay tape for easy application. Applying most of these types of stickers involves rubbing firmly down on the sticker, then peeling it up off of the backing paper from any corner. Once removed, please discard backing paper and apply decal left to right or vice versa onto desired surface. Carefully rub firmly pressing out the air as you go (squeegee or credit card). Once applied simply remove the application tape and you will be left with only the decal. Larger decals require positioning it in place with tape before installation. 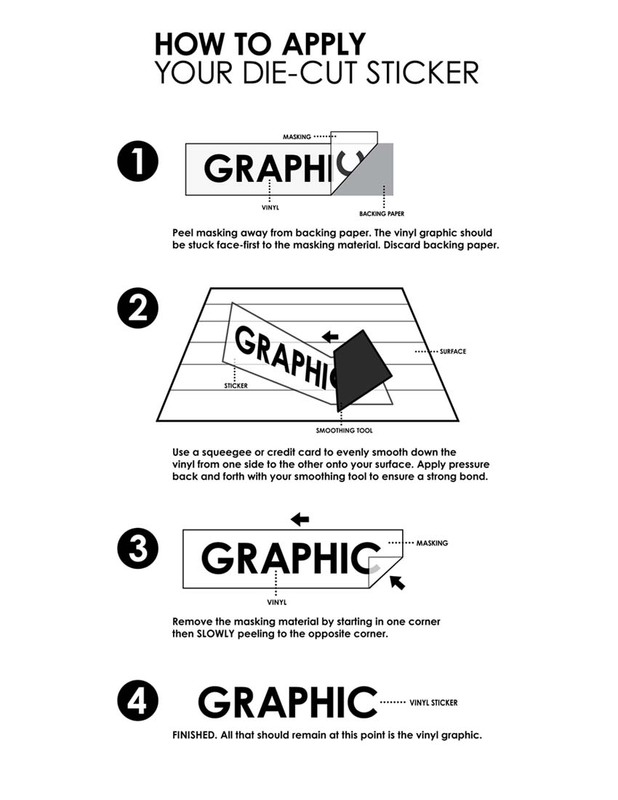 Below is a quick illustration to show the basics of vinyl decal installation. We offer a wide variety of items for visual purposes only. Our stickers or other products are not meant to make anything safer or road legal. All products are used at the buyers risk and we are not to be held responsible for any accidents or misuse. All items we sell are 100% safe and are backed by our 100% Satisfation Guarantee. Decal installation is very easy and simple. If you have any concerns please email us on our contact page, and also looking on http://www.youtube.com for application videos is very handy indeed.